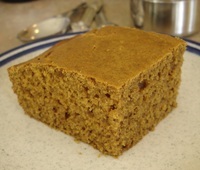 This whole grain cake has no refined sugar but lots of flavor. Just because it is called Healthy and made with Whole Wheat, you may be surprised at how great it tastes. With winter still upon us, try this cake warm from the oven with some whipped cream. Uh… low fat whipped cream.